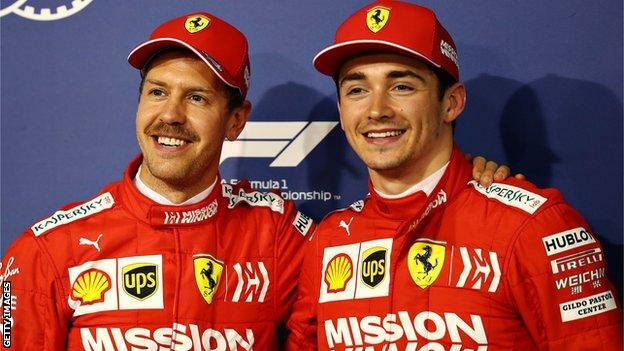 Sunday's Bahrain Grand Prix is live on 5 live Sports Extra and the BBC Sport website from 16:10 BSTCharles Leclerc's first Formula 1 pole position came in only his second race for Ferrari and at what was effectively his first chance of taking one, but it says a lot for his potential that it was not a surprise at all.The 21-year-old Monegasque has seemed destined for success for years now. When he came to F1 last year, it was only a matter of time before he was in a top team. And when he joined it, the question was not if he would make a success of it, but when.Not yet 23 races into Leclerc's career, it is far too early to know how far he can go, but that he has already delivered on the potential that was so clearly there is a promising sign. Ferrari were out-paced at the season-opening race in Australia a fortnight ago - which came as something of a surprise after a strong showing in pre-season testing.But in Bahrain, as Mercedes said after qualifying, the performance was back to expectations, and Leclerc was clearly a strong contender for pole from the beginning of the weekend. Fastest in first practice, pipped by team-mate Sebastian Vettel in the second, fastest again in final practice, and in all three parts of qualifying. Leclerc was the man to beat.Vettel was put on the back foot with a mistake on his first run in second qualifying, provoked by being in too much traffic, which left the four-time champion with only one run in final qualifying. But the likelihood was that Leclerc was going to take some beating anyway. "I was really happy for him - it's really cool. From what I know of him, he could always do these laps - sort of, 'Where did that come from?' Today was maybe one of those laps. "But even Albon has been surprised by Leclerc's quick progress. "Seeing Charles fighting with Seb so early in the season," he said. "I thought it would take longer for him to be able to get there." Leclerc's pole, with Vettel alongside him on the front row, raises some intriguing questions about how Ferrari will approach the race.Before the season, new team boss Mattia Binotto effectively indicated that Vettel would be the team leader, at least at the start of the year, by saying he would be given "priority" in certain situations, pointing to his greater experience.In Australia, Leclerc caught Vettel in the final stint, thanks to offset strategies, and was ordered to hold position behind. That has inevitably led to questions as to how Ferrari will approach this race. Would Leclerc be allowed to stay in front if he found himself there, Binotto was asked on Friday? "What is important is our two drivers are not fighting and taking any risk when battling together. But there is no doubt that if Charles is ahead on the first lap, he will stay, and if at the end of the race he is ahead, he will stay ahead. "Did that mean if they were running in consecutive positions, they were not allowed to battle during the race? "Let's wait the next races and let's see if there is any incidences and how we react. "The drivers were giving nothing away after qualifying. "We haven't done the pre-race meeting yet," Leclerc said, "so at the moment I don't know. I will do everything to keep my place but we are a team so we have to work together. ""We have the front row and we need to work hard to make sure we finish one-two," Vettel said. "Charles starts ahead so he has the advantage of pole and we see how we go. "The temptation, if the mindset is that they see Vettel as their likely main title contender given Leclerc's inexperience, might be to find a way to get the German ahead during the race - for example on strategy at the pit stops.But the way Leclerc is developing, there is a chance that may not, by the end of the season, turn out to be a wise decision. Binotto has some thinking to do. Why did Ferrari improve so much?